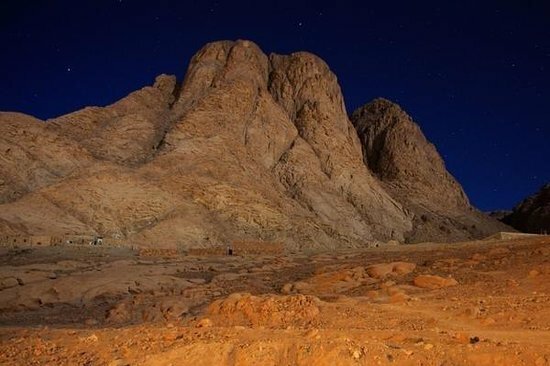 St. Barnabas Blog: We have been talking about the Hebrews’ escape from Egypt and their travels through the wilderness of the Sinai Peninsula to a mountain where God was to appear. What happened? Anaiah: The main thing is that God entered into a covenant with the whole Hebrew people. SBB: A covenant is a contract or treaty? Anaiah: Normally, yes. One party makes a promise and the other makes a promise in return. Superficially, this covenant with God looks like a contract of that type: the people promise to obey God’s commands and God promises to return them to their homeland. But much more than this is going on. As we discussed earlier, God had promised to make Abraham and his descendants a blessing to the whole world. This is God’s plan to address sin, evil, and death, culminating in the greatest gift of all, union with himself, union between finite humanity and the transcendent creator of the universe. An important part of the plan is to train the Hebrews in how to behave as God’s holy people, which is a way of teaching them about the inner life of God himself. SBB: What do you mean by that? Anaiah: God is of course unknowable by us. Even other people are to some extent unknowable by us. If we want to learn about people in a foreign country, one good way is to go and live with them, to see what they do. God is offering the Hebrews a glimpse into his inner life by letting them live with him according to his rules. SBB: What are the rules? Anaiah: The most important rules are known as the Ten Commandments. You are familiar with these, many centuries later? SBB: Of course. I notice that these rules govern relationships among people. To what extent can these relational rules be considered as providing insight into God’s inner life? Anaiah: That is a good question. One of the names for God, Elohim, is grammatically plural. And sometimes God is represented in the Bible through the metaphor of a king surrounded by courtiers. There appears to be some mysterious multiplicity in God that we do not understand. SBB: So tell me more about how the rules help us understand who God is. Anaiah: First, we are instructed to recognize God as the only god, to serve him only, and to avoid idols. SBB: Could God be accused of being self-centered here? Anaiah: Think of it this way. Suppose you are lost in a dark cave. A rescuer is coming to help. You are inclined to panic, but the rescuer says, “Stay calm, listen to my voice, come toward this light.” Would you consider the rescuer self-centered? SBB: The rescuer is doing the sensible thing to save the person who is lost. Anaiah: The same is true here, I think. God knows that our only safety is to come towards him, to focus our attention and hopes on him. So he mercifully allows us to do that. SBB: That makes sense. What is the concern about idols? It seems kind of old fashioned because we don’t worship cult statues anymore. Anaiah: The temptation to serve things other than God is perennial, whether or not you use cult statues. The Hebrews were familiar with the religious practices of the Egyptians. Egypt was full of statues of gods and kings. The statues were not, for the most part, worshiped as if they had magical powers. They formed part of a cult that, along with various rituals and practices, enforced an understanding of the universe as governed by a multiplicity of gods whose primary interests were in one another, but who could be persuaded to grant the annual inundation and perhaps to grant the kings an interesting afterlife. The entire cult was a form of idolatry because it oriented the people’s energy and attention to something that was not true. SBB: So in that sense I suppose we have idolatry today. Anaiah: From my observations, many people in the United States seem to regard the universe as a collection of atoms governed by complex laws that only experts can understand. They rely on experts to rule them and spend their energy on more and more elaborate means of entertainment. This is not a realistic picture of the universe and, more importantly, it does not bring people closer to God. SBB: Are the other commandments also helpful in re-orienting ourselves towards God? Anaiah: Of course, and we’ll talk about them next time.